November 22, 1963 is a date that almost everyone associates with JFK and the assassination. But 50 years ago today is also the day Walt Disney flew over Central Florida, and saw the beautiful land around Bay Lake. It was the day he decided that this was where he would build Walt Disney World. At the time Orlando was little more than a small town surrounded by cattle ranches and citrus groves. But Walt, being a man of vision, could see so much more. His ideas for the theme park that would be bigger and greater than anything he had done at Disneyland were only part of the picture. He also envisioned a grand community; a working community where he would be able to use the ideas and methods he and his Imagineers had crafted to create a unique American environment and a city of tomorrow. As his private plane circled the area over Bay Lake, he and some of his most trusted advisers looked down from the windows of “Ear Force One”. Some who were with him in the plane that day have said that when Walt looked down at Bay Lake, and saw the pristine blue waters and a beautiful island sitting right in the middle, is when he said simply “this is it.” They had already been to sites near Niagara Falls, Washington DC, and St. Louis, Missouri. But Central Florida was the one that caught Walt’s imagination. It was only later, when they stopped to refuel, that Walt and his advisers heard the news that far away in Dallas, TX, Pres. Kennedy had been shot. 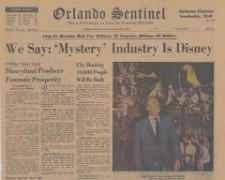 And while many remember that day as a very dark and sad day; a day that in many ways changed the mood and direction of an entire country, it also is the day that a dream took hold and Walt Disney transformed Florida into the place we know today.